Our thinking and our actions impact on how we react to our experiences in life. We can choose to resist and possibly react through our ego or we can choose to accept whatever is happening around us whilst taking action to change the situation. When we learn to accept what is happening in our lives and greet every experience as an opportunity to grow we start to detach emotionally from the outcomes of that situation and from the fear of taking action. We learn to become the observer, of not only the experiences that are presented to us, but we also become the observer of our thoughts. Our thoughts are real; they have a certain level of energy attached to each one. When we think in a negative way e.g. with jealousy or with judgmental feelings, the energy of that thought is enhanced and can be very damaging to the recipient, as well as to our self. The strength of a thought is born out of the amount of feeling we attach to it. That’s why positive thoughts help us feel better, lighter, and more hopeful. Negative thoughts have the opposite effect; they create pain, misery and stress resulting in a build up of toxins within our cellular system. Our body then has to work harder in trying to cope with the effect of toxin build up. So instead of our cells using their energy in maintaining balance within all of our internal systems, they instead have to use up their energy, and in some instances enormous amounts of energy, just to keep us going. It’s no wonder then we get tired and sick. When our internal systems have run out of energy, when we are not paying attention and we are continually compounding the issue, our body starts to slow down, even shuts down and diverts what little energy it has left to keeping us alive. Our thoughts are generated from within us, either consciously or unconsciously and can be a result of our upbringing, from our genetics, past experiences, or experiences in the womb. If we choose to think and act in a creative, positive way, looking for the optimum outcome that we desire, we will get that outcome. We are presented with many opportunities throughout each day to choose and create thoughts and behaviors that serve our highest good. And it is in those moments that we can choose to be the master of our reality or we can be a slave to our ego and feed it by encouraging more negative thinking. If we want happiness, joy and peaceful living, we must learn to think that way. Whatever comes to us in life comes from our thinking and the way we act. Whether we like it or not, we are the creators of our life and our thinking, our responses to life’s situations engineers the results that we inevitably experience. 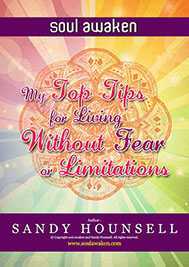 Get your copy of my e-book,“My Top Tips For Living Without Fear Or Limitations” and meditation “Connecting To Your Source”. When you apply these easy to follow practical soul tips, your thoughts will be born from a most loving mindset, creating your future that is both enriching and Self fulfilling.